The Prime Minister, Tshering Tobgay traveled to Kathmandu, today, on a special flight to convey solidarity and support to the government and people of Nepal, following the disastrous earthquake that struck the region on 25 April. Lyonchhen personally handed over a cheque for Nu 62 M (USD 1 M) to the Prime Minister of Nepal, Sushil Koirala as a contribution from the people of Bhutan to the people of Nepal towards rehabilitation efforts. Lyonchhen conveyed His Majesty the King’s deep concern and anguish for the people of Nepal for their sufferings brought about by this natural disaster. 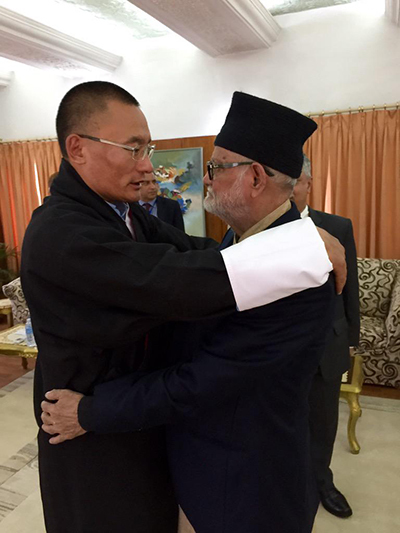 He also delivered letters of condolences from His Majesty to the Prime Minister and President of Nepal. A special medical team also traveled to Kathmandu in the special flight to lend assistance to the Nepalese people, upon the Royal Command of His Majesty the King. The 63-member team comprises of a medical team coordinated by the Kidu Mobile Medical Unit of His Majesty’s Secretariat, Royal Bhutan Army (RBA) personnel, medical specialists from the Ministry of Health, and DeSuups. The team will assist in medical treatment of victims of the disaster and is equipped to set up outdoor medical camps. They are carrying medicines and medical equipment and relief materials, including clothes and blankets from His Majesty the King. Lyonchhen will be returning by the special flight today afternoon, which will also bring back Bhutanese who are stranded in Nepal. Meanwhile, the National Flag was flown at half-mast today to mourn the loss of lives due to the earthquake. His Majesty the King and representatives of the government offered 1,000 butter lamps at the Kuenrey of the Tashichhodzong for the victims of the disaster. Bhutanese who are currently in Nepal and wish to return to Bhutan should contact the following numbers: +977-9843296252, +977-9818154093 and +977-9851039671. Given the current situation, all Bhutanese are advised not to travel to Nepal until further notice. While reading this news and photograph published here above melted my heart and could not stop tears rolling down. A small and poor country like Bhutan has a big heart and gracious sympathy to her neighbouring country Nepal. Of course Nepal s in deep crisis now because of Earthquake, no matter what or how much aid Bhutan can grant; but the most important thing is the personal visit of Mr Togbay to Nepal and offer the aid. Let’s keep a deep relation always between Bhutan and Nepal. Salute to Bhutan king and his government.